This First Look guide helps you connect systems together with InterSystems IRIS Data Platform™ integration productions. To improve efficiency, systems originally designed to perform a single function need to be integrated. For example, you can gain efficiency by integrating individual systems that track inventory, order materials, record sales, and control shipping. After a merger, systems that perform the same function in the separate organizations need to work together for the unified organization to be effective. Systems use different communication protocols: one system may use TCP, another uses SOAP, and a third uses REST. Systems use different messages with different formats or based on different standards. You may be required to guarantee that messages are delivered successfully to the right system and be able to detect and correct failures. You have to monitor the system transferring the messages, provide a queue for messages if too many come at one time, and monitor overall system performance to ensure that there aren’t any roadblocks. While it is possible to code a custom application to connect systems, it is much easier and faster to develop an InterSystems IRIS™ production. InterSystems IRIS provides a framework that allows you to connect systems and either minimizes or eliminates the need for custom code. Business services connect with external systems and receive messages from them. Business processes allow you to define business logic, including routing and message transformation. Business operations connect with external systems and send the messages to them. You have two separate systems: one is collecting data from multiple networked devices and the other is a work order system that tracks broken devices and the repair process. The current process depends on human intervention to monitor the devices and initiate the repair process. This has caused delays and is unreliable. You have been given the task to connect the two systems together: to monitor the data being collected and to automate initiating the repair process. You know how to detect faulty devices in the data collection system and know how to initiate a repair, but the two systems store data in incompatible formats even when the data represents the same item. You also need to record the actions when a repair is initiated from the data collection system. You can solve this problem using an InterSystems IRIS production. It provides the framework for defining an interface that accepts messages from the data collection system, transforming the message into one that can be understood by the repair system, and then sending it to the repair system. It also stores a record of the message path. For demonstration purposes, the production in this document uses file adapters and represents the external systems as files. Because most of the work dealing with the external system is done by adapters provided with InterSystems IRIS, developing a production connecting to the external systems with REST, TCP, SOAP, or HTTP is very similar to developing a production using file adapters. In this section, you will create a production using an inbound and outbound file adapter. You will use business services, processes, and operations built in to InterSystems IRIS, so you won’t have to download any code. Select System Administration > Configuration > System Configuration > Namespaces to go to the Namespaces page. 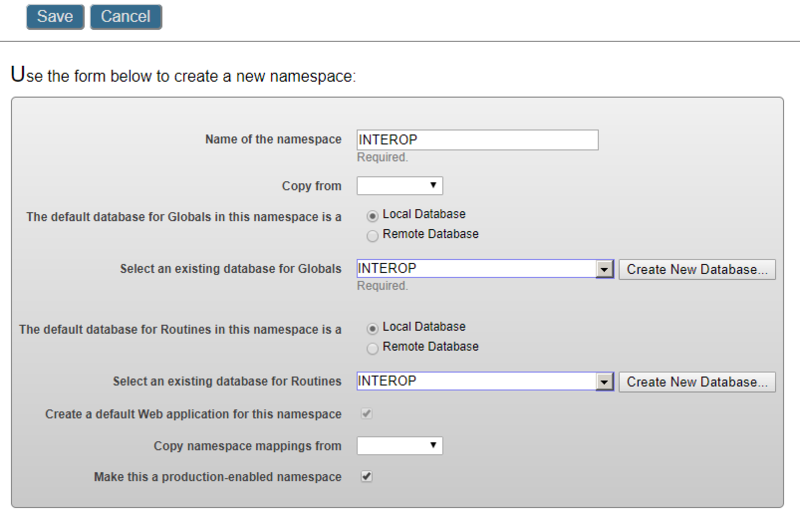 On the New Namespace page, enter the name for the new namespace, such as INTEROP. Next to the Select an existing database for Globals drop-down menu, select Create New Database. This displays the Database Wizard. On the first page of the Database Wizard, in the Enter the name of your database field, enter the name of the database you are creating, such as interop. Enter a directory for the database, such as C:\InterSystems\IRIS\mgr\interop (Windows system) or \usr\irissys\mgr\interop (UNIX, Linux, or macOS system, including a cloud node). On that page, select Next. On the next page, select Finish. Back on the New Namespace page, in the Select an existing database for Routines drop-down menu, select the database you just created. Ensure that the check box to make this an interoperability-enabled namespace for productions is selected. Select Save near the top of the page and then select Close at the end of the resulting log. You have now created an interoperability-enabled namespace. Add one business service and two business operations to the production. Configure the business service and business operations. For a cloud instance, use the docker exec command to open a bash shell in the try-iris container, as described in Changing the InterSystems IRIS Password on the Linux Command Line in Connecting to InterSystems IRIS in the Cloud, and create four directories on the container file system. For an installed instance, create four directories on the local file system. This exercise assumes the following Windows directory paths; substitute the paths of the actual directories you create. Select Interoperability and, if prompted, select an interoperability-enabled namespace. If a production is currently running in the namespace, open it, and then select Stop. Return to the production list page. Specify a package name, such as TEST, and a production name, such as FileProd. You will be creating a generic production that can be used for any purpose. Select OK to create the production. Select the Services plus sign to display the Business Service Wizard. In the Service Class drop-down menu, select EnsLib.File.PassthroughService. Specify the Service Name FileService. Leave the Enabled check box clear. Repeat these steps for the two business operations. Start by selecting the Operations plus sign to display the Business Operation Wizard. Use the EnsLib.File.PassthroughOperation class for both operations. Name one operation WriteFileOp and the other WritePDFsOp. In the File Path field, enter c:\Practice\In. In the Archive Path field, enter c:\Practice\Work. In the Work Path field, enter c:\Practice\Work. In the Target Config Name field, select WriteFileOp. Leave the other fields with the default values. In the File Path field, enter c:\Practice\Out for the WriteFileOp operation and enter c:\Practice\PDFsOut for the WritePDFsOp operation. Start the production by selecting Start. In a few seconds, the file is moved from the c:\Practice\In directory to the c:\Practice\Work directory. A time-stamp is appended to the file specification. For example, if the original file was hello.txt, the work file could have a name such as hello.txt_2018-05-07_17.24.57.056. A new copy of the file is written to the c:\Practice\Out directory. It also has a time stamp appended to it. The circles in the production diagram should stay green. If the circles turn red, it means there’s an error in the production. Go over the preceding steps and ensure that the directories exist. Select the FileService in the production configuration page and select the Messages tab. It lists each message that went through the production. Select Go To Message Viewer. 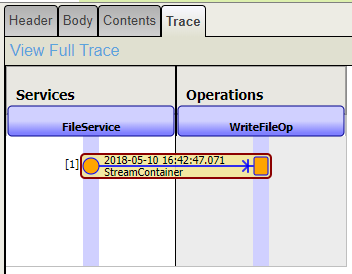 Select a message in the Message Viewer and select the Trace tab. It will show that the message went from the FileService to the WriteFileOp operation. Note that the message type is Ens.StreamContainer and that one of its fields is OriginalFilename. In the Business Process Class drop-down menu, select EnsLib.MsgRouter.RoutingEngine. Select the Auto-Create Rule check box. Specify the Business Process Name FileRouter. Select OK to the dialog box to approve the rule class name. Select the magnifying glass to the right of the Business Rule Name. This starts the Rule Editor and displays the rule that was automatically generated when you created the business process. Double-click the constraint value in the rule. Enter FileService in the Source field. Enter Ens.StreamContainer in the Message Class field. Select the rule and then select when in the Rule Assistant. Select the when condition value and enter Document.OriginalFilename Contains ".pdf" in the text box above the rule diagram and then select OK. Select the when clause in the diagram and then select send in the Rule Assistant. Double-click the target value and select the WritePDFsOp configuration item. Select the when clause in the diagram and then select otherwise in the Rule Assistant. Select the otherwise clause in the diagram and then select send in the Rule Assistant. Double-click this send clause’s target value and select the WriteFileOp configuration item. Select the Target Config Name FileRouter check box. Clear the WriteFileOp check box. Your production is now complete. The FileService will send all messages to the FileRouter business process. The FileRouter will either send the message to the WritePDFsOp or the WriteFileOp operations based on the rule.